As a child of the 60’s, one of my favorite songs was “Innisfree,” as sung by Judy Collins. It still is. So when I became a gardener, and learned that there was a famous garden in Millbrook, New York, by that name I had to add it to my Hudson River Vally garden itinerary. The 40-acre lake at Innisfree is glacial. The views, however, are anything but. From 1930 to 1960, Innisfree was the private garden of Walter and Marion Beck. 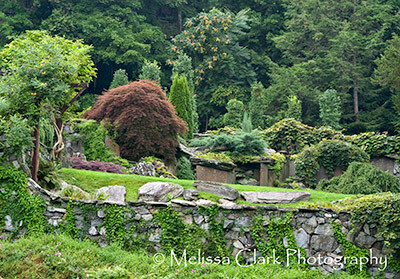 With the help of landscape architect Lester Collins, the Becks used Chinese garden design techniques to guide the development of the garden. Drawing on the history of Chinese paintings and gardens dating back a thousand years, Walter Beck devised the term “cup garden” to describe the concept behind Innisfree: that of a garden area or vignette that draws attention to something rare or beautiful by setting it within an enclosed or discrete space, to enable to viewer to enjoy it without distraction. A cup garden can be a meadow framed by trees, a lotus pool, or a single rock covered with lichens and sedums. Thus, there has been no attempt to relate any of the planting design, for example, to the stone remnants of the foundation of the original house which are still on site. Berberis 'Helmond Pillar' and sedums provide dark red contrasts to the chartreuse and green plantings in this terrace area at Innisfree. 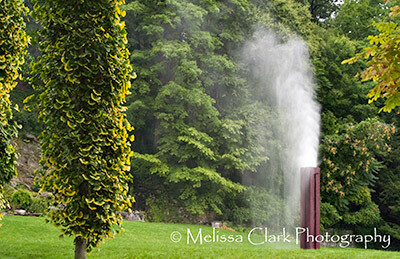 At Innisfree, I strolled through a series of carefully framed views, seeing terrace gardens, a meadow stream, carefully placed massive stones (most of which came from the forested areas on the site), and a series of waterfalls, mist fountains, water sculptures, and pools. 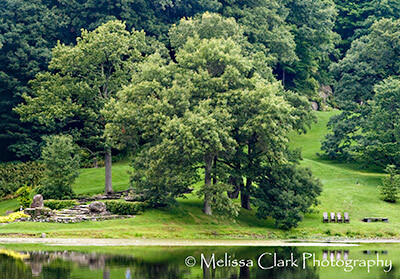 The garden is 150 acres in all, including a 40-acre glacial lake. Most of the plantings, however, are native. Innisfree, located in Millbrook, NY, is open from May 7 to October 20 Wednesdays through Sundays and on legal holidays. For more information, visit its website. Opus 40 was constructed completely by hand, using blasting powder and hand tools. Another stop on my Hudson River Valley trip in 2004 was Opus 40, in Saugerties NY, near Woodstock. Technically I suppose you could argue this isn’t a “garden,” but I had read enough about it on the Internet while I was researching my trip that I was very intrigued and wanted to check it out. I am directionally challenged at the best of times, and this was long before I become joined at the hip with my Garmin Nuvi GPS. I won’t bore you with how many times I got lost en route to this location, but my journey was capped off with discovering on my arrival that the weekday in question was one when the site is usually closed to the public. The powers that be, however, succumbed to my pleas since there was already a painting class working on site. I hastily paid my five dollars admission fee and started exploring, mouth wide open and D100 (no tripod) in hand. 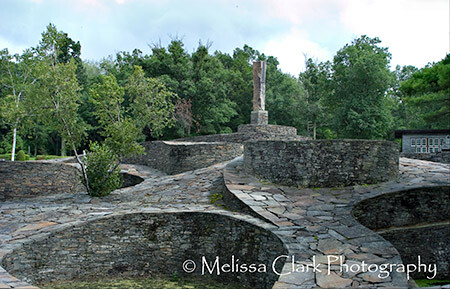 Opus 40 is one of the most unusual created landscapes in the Eastern United States. Its creator, Harvey Fite (head of the Fine Arts Division at Bard College from its inception until his retirement in 1969), spent 37 years fashioning a series of ramps, steps, pools and terraces constructed from stone from a quarry on the site, capped with a nine-ton monolith. Opus 40 was built completely by hand, using only blasting powder and hand tools; no mortar or cement was used. Changes in the light produce subtle shifts in the way the stone looks. Planting wells still contain a few trees and shrubs, although many have died. Here, the "garden" is almost purely hardscape with trees for a backdrop. Some of the ramps have planting wells that contain trees, although a number of these ‘beds’ are now empty, the trees having failed to survive. Some of Fite’s sculptures surround the periphery of the site, although the central structure is by far the most powerfully affecting component of the site. The colors of the stone shift subtly as the light changes, and the effect is arresting. The nine-ton monolith is the central feature of Opus 40. 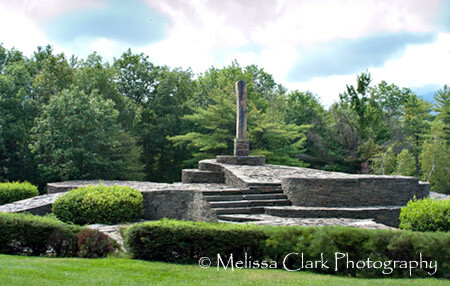 Opus 40 is located in Saugerties, New York, near Woodstock. It is open on weekends and holiday Mondays. For directions, details on its hours and admission information, visit its website. If you’re going to be in the area, it’s worth a detour. About five years ago, I took a busman’s holiday in August while my sons were out hiking with their father in Kauai. My own garden looked dreadful – typical for Washington in late summer. 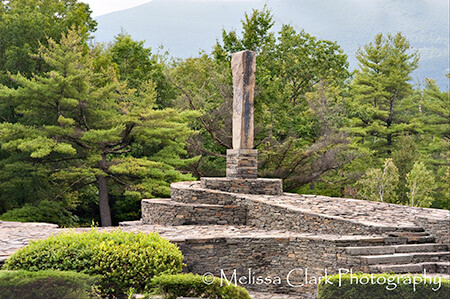 Wanting to explore some gardens in the Hudson River Valley, which I’d never visited before, I constructed a driving itinerary that started in Hyde Park, NY and included stops at Opus 40, Stonecrop Gardens, Innisfree Garden, and Wave Hill Garden. The other day, my friend Lori asked me if I’d ever visited Wave Hill, and I remembered this trip so I decided to re-visit my photos from that little odyssey, starting with my last stop, in the Bronx. Perched on a hill overlooking the Hudson River and the Palisades, Wave Hill consists of 28 acres of gardens, greenhouses and woodlands open to the public since 1965, five years after the Perkins-Freeman family deeded the property to the City of New York. 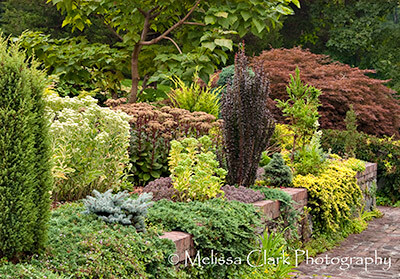 Much of its stunning visual appeal can be attributed to the stewardship of Marco Polo Stufano, Wave Hill’s first Director of Horticulture, whose guidance transformed the site from neglected to spectacular and whose cutting-edge vision and gifts for combining colors, textures and forms still informs the garden’s varied borders and planting designs. From the Pergola Overlook, full of seasonal plantings in containers that change frequently, to the Aquatic Garden – at its best in late summer and fall – to the Wild and Flower Gardens and beyond, there is eye-arresting beauty and information for every level of gardener to absorb and reflect on. This is a treasure for everyone, and shouldn’t be missed if you’re visiting or living in the New York area. Wave Hill is open Tuesdays through Sundays year-round and certain holiday Mondays. Closed New Year’s Day, Thanksgiving and Christmas. For more information, visit its website.